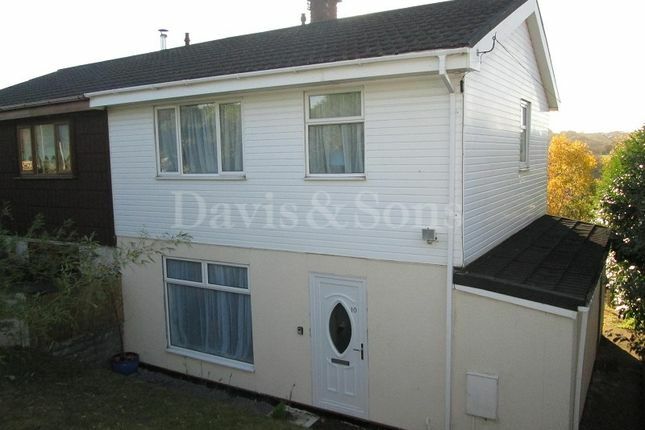 Davis and Sons are delighted to offer for sale this much improved semi detached house situated in the village of Swffryd. The property is located centrally for ease of access to Cardiff, Newport, Bristol, Pontypool and Brynmawr. Junior, Infants and Nursery Schools are close by along with the local general store which incorporates the Post Office. The bus route is a short walk away and the train stations are in Newbridge and Llanhilleth. Viewing highly recommended by the agent. Double glazed obscured window to rear, white suite comprising, low level WC, corner style wash hand basin with a feature tap set in a vanity cupboard, heated towel rail/radiator, textured ceiling, plastered walls, ceramic tiling to floor. Double glazed window to side, textured ceiling, plastered walls, plumbing for automatic washing machine, base cupboard, stainless steel sink with mixer tap, complimentary work surfaces with matching splash backs, ceramic tiling to floor. Double glazed window to rear with views over the surrounding area, coved and plastered ceiling, plastered walls, built in cupboard with hanging space and shelving, radiator in a feature cover. Double glazed window to front, coved and plastered ceiling, plastered walls, radiator in a feature cover. Double glazed obscured window to rear, white suite comprising a square shaped double ended bath with a shower mixer tap and chrome feet, pedestal wash hand basin, low level WC, corner style shower cubicle with a mixer shower with a rainfall and regular shower heads, feature radiator, ceramic tiling to walls and floor, plastered ceiling. Steps leading down to a gravel path which leads to the main entrance. The garden in sloping and laid to grass with shrubs and privet to boundary. Pathway leading to the rear access door. Flower and shrub borders. Tiered garden laid to gravel and grass with a sloping path and decked steps. Flower and shrub beds, trees and laurel hedge, timber garden shed to remain, car hard standing, rear lane access. Property descriptions and related information displayed on this page, with the exclusion of Running Costs data, are marketing materials provided by Davis & Sons, and do not constitute property particulars. Please contact Davis & Sons for full details and further information. The Running Costs data displayed on this page are provided by PrimeLocation to give an indication of potential running costs based on various data sources. PrimeLocation does not warrant or accept any responsibility for the accuracy or completeness of the property descriptions, related information or Running Costs data provided here.